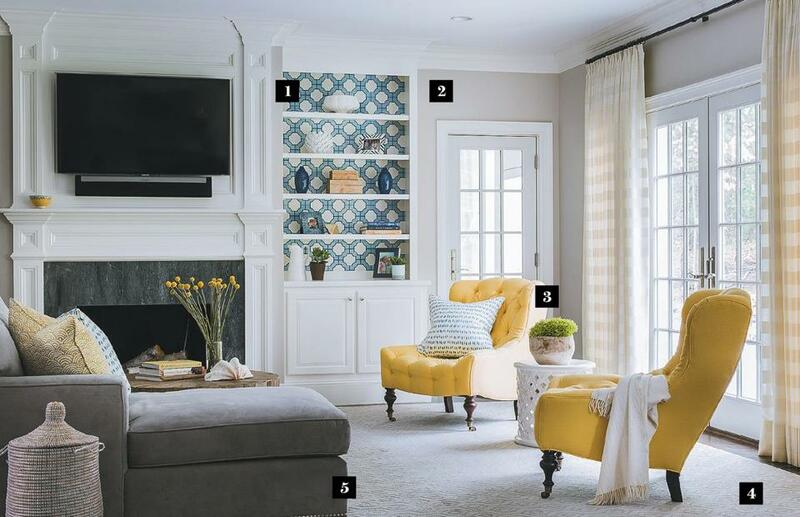 Sturdy fabrics and daring color create a fun space that’s practical, too. 2. Walls are painted Revere Pewter by Benjamin Moore, a lively gray, says Talancy. 3. 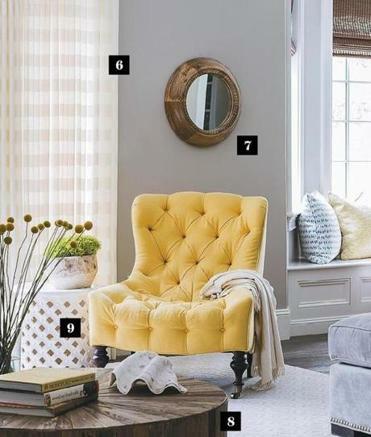 Tufted slipper chairs, comfortably contoured, are upholstered in a sunny yellow Kravet fabric. 4. A muted gray and ivory wool area rug feels luxurious underfoot. “Since the chairs and wallcovering are so vivid, the carpet needed to be subtle,” says Talancy. 5. The sofa has the feel of velvet but is made of a durable synthetic fabric. Talancy added nailhead trim around the base. 6. Horizontal stripe sheers by Lulu DK softly dress the windows. “The fabric feels like linen and has a beautiful drape, but it’s synthetic,” says Talancy. 8. The round coffee table, a piece by Gabby crafted of reclaimed wood, has the appeal of driftwood. 9. A garden stool from Pottery Barn acts as a handy perch.